NOTD: World Championship and Birthday! Hello all! It’s the 23rd of June, one of the longest days of the year, and lucky me: also my birthday! I’m not really doing anything special today, but tonight I’m going to watch football, since the Netherlands are playing against Chile. 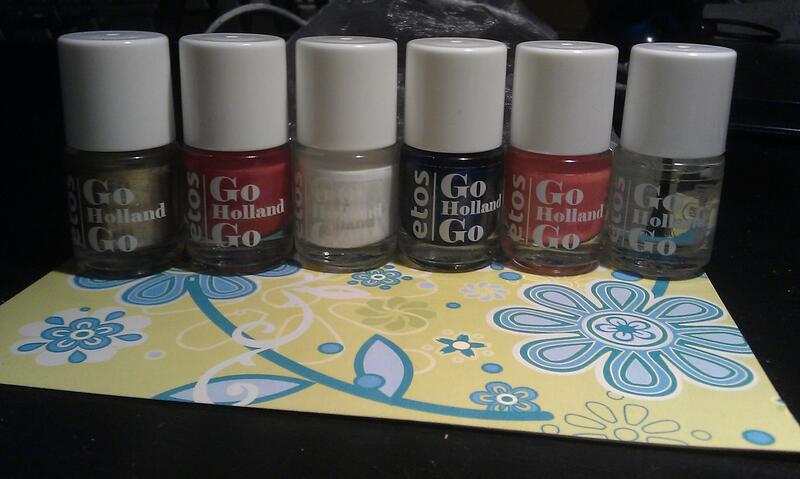 I also got an early birthday gift on friday, when I received the colourful nail polishes I won from IOnTrend! Here’s the lovely set! I’m sorry for the camera phone pic, I haven’t gotten around editing the pics I made with my proper camera yet. I’ll do a review/swatch of the polishes later on! 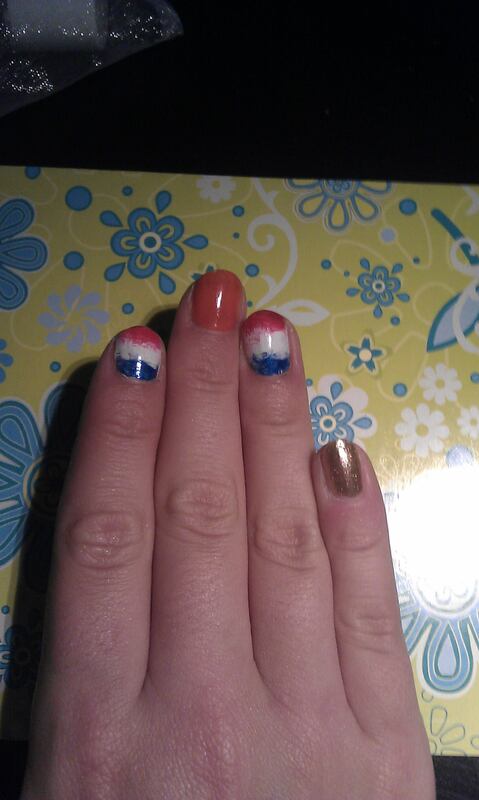 But first, I want to share my World-Cup-ready nails! On my left hand I painted my pink and thumb with the gold (which has little orangey gold flakies! ), and my middle finger with a bright in-your-face neon orange. 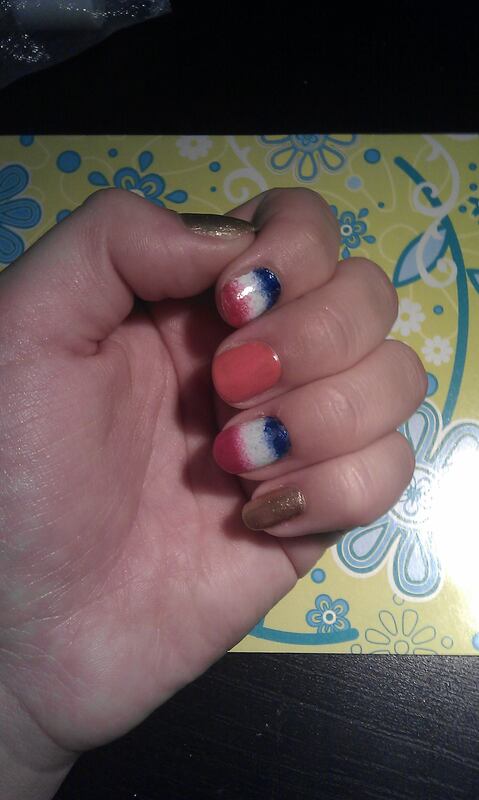 For the flag, I sponged a red-white-blue gradient on my ring and pointy finger. On my right hand, I did the same for my pinky, middle finger and thumb, and tried something different on my ring and pointer. You’ve probably heard of- and maybe tried- the dry brush technique. You wipe off most of the polish on the edge of the polish bottle, wipe it some more on a piece of paper, and make light strokes over your nails so you get a little bit of polish on your nails. It’s easy to layer since it dries quickly because you barely put any polish on your nails. I finished this mani with the top coat that came with the set. There was some minor chipping/tip wear, but with some touch ups, I got to wear it since friday already! Are you and your nails ready for the World Cup? Nog gefeliciteerd met je verjaardag! En wat een mooi setje nagellak heb je gewonnen! Dankje! Ik ben erg blij met het setje ^^ Eens kijken of ik de tijd kan vinden om er nog een mooie review over te schrijven; ik wil echt graag mooie close-up foto’s laten zien van de gouden lak, want die is echt heel gaaf!! Dankje!! Ben echt superblij met het setje, eerste keer dat ik wat van een blog win en dan nog zo met m’n verjaardag en zo’n schattig setje.. Yay! Gefeliciteerd! Leuke nailart. Dat we de finale halen!